Step into a world of Classic elegance and Hospitality as you check into Hotel Meyrick. Relax at the Square Spa on the fifth floor of the Hotel, and enjoy the Jacuzzi and outdoor rooftop hot tub. Dine in their AA Rosette Award Winning Restaurant- No 15 on the Square or the Gaslight Bar & Brasserie, where their team are happy to help you select from their extensive range of premium gins, whiskeys and cocktails. Hotel Meyrick is delighted to offer a fantastic prize to one lucky winner*. The Prize is their “Winter Wonder “ Package*- the perfect pick me up over the Winter Months. It includes a Mid-week 2 night Stay for two guests, with Dinner on a night of your choice in their restaurant- No 15 on the Square, and full Irish Breakfast next morning. To be in with a chance to win this great prize simply answer the question in the form below. As the Winter months arrive, treat yourself to the ultimate indulgence and a little time out from the real world. Sink into one of the parlour lounge’s relaxing chairs and enjoy Hotel Meyrick’s Afternoon tea, served daily from 1- 6pm. The Hotel will be introducing their Limited Edition Festive Afternoon Tea on Monday November 19th which will be available to book up to Sunday January 6th 2019. 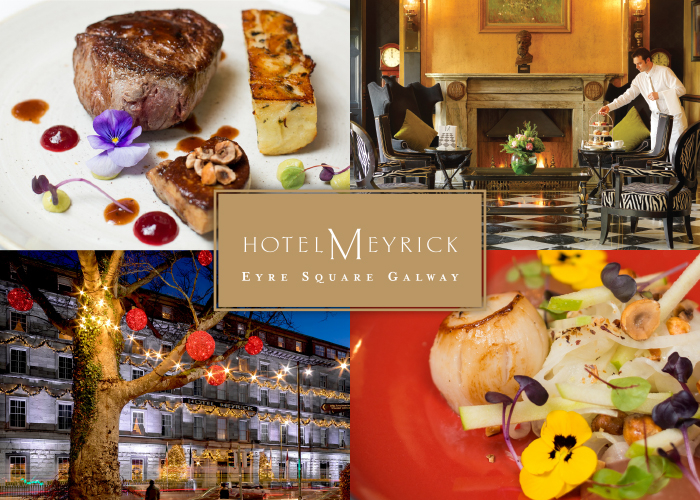 The true home of Christmas in Galway City, Hotel Meyrick is renowned for its tradition of hospitality, service and food and no more so than at this festive time of the year. As Galway city’s most iconic building, Hotel Meyrick sparkles in the lead into Christmas providing the perfect back drop to the Galway Continental Christmas Market. The Christmas Market is literally on the steps of the Hotel on Eyre Square. For a full range of packages and dining options see www.hotelmeyrick.ie or call 091 564041. Hotel Meyrick, Eyre Square. Galway City. 2. Prize Valid Sunday – Thursday Only. Available to redeem mid-week in November 2018 or up to December 13th 2018 only. 4. Not valid on festive occasions. 5. No cash Alternative & Non-transferable. 6. Once selected, the winner will be contacted by the Galway Advertiser to arrange delivery of the prize. 7. Winners must be over 18 years of age. 10. Entry to this promotion shall be deemed full and unconditional acceptance of the terms and conditions. 11. The promoters reserve the right to amend these terms and conditions. 12. Details of the competition winner will be posted on the Galway Advertiser's Facebook page and the winner will be notified by email. You have five days to claim your prize once contacted by email. 13. The closing date for entries is Monday 29th October 2018.